If you are excited about the new Sonic Team developed Sonic game, Sonic Runners then the wait is over (maybe). The game is officially out on the Google Play for Android, but sadly many people (myself included) have been plagued with the ‘This app is incompatible with all of your devices.‘ message. Meaning you can’t download it at this exact moment. Many people have been saying the app won’t be officially up until February 26th (time zone differences from Japan). As for the Apple version, that has only appeared in the Japanese iTunes, which you can see below. If I get my hands on the APK file, then I will post it here later. If you get the game downloaded, tell us what you think in the comment section. Will keep you updated when its officially up to download in the US. 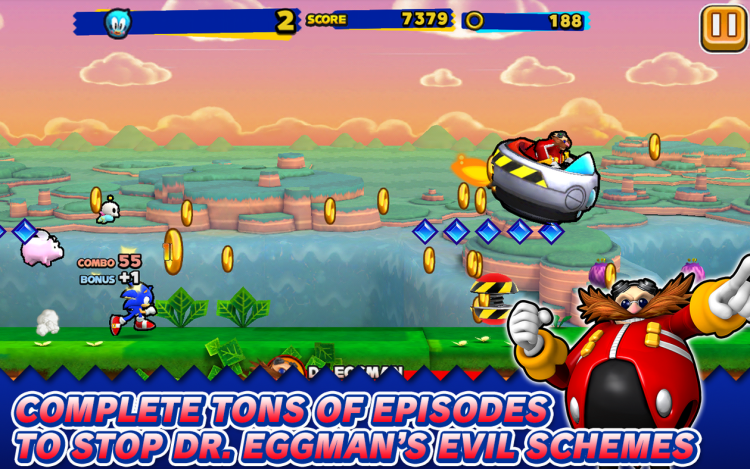 Sonic Runners is a new mobile game developed by the Sonic Team in Japan. We are soft-launching it in select countries to see how the game does and to work out any bugs. No decision has been made yet whether it will be released in the US or Europe. It will depend on our observations during the soft-launch phase which could take several months. To learn how to download and install a APK on Android, please read this. Here is a work around for non-Canadian iPhone/iPad users to get Sonic Runners. Haven’t played it yet, but the game launches fine for me with the APK. Game Boots fine,but the included Data folder does NOTHING for me. I had to redownload everything ingame to got it working. APK works perfectly fine for me. Thanks! Is the apk supposed to download as a .zip file? Hey Dillon. Yes. Its a zip file with 2 things in it. One is a folder called ‘Android’ and the next is a APK file. Drop the APK file anywhere on your phone. If you look at the root of your phone, you should see a ‘Android’ folder too. Open it on your phone and open data. Now go to the folder also called ‘Android’ that you downloaded and go into data and copy the ‘com.sega.sonicrunners’ folder into the data folder on your phone. Unplug, use a file manager to find the APK and install. yes, you need some type of file manager that can extract that file. then you can launch the extracted file and play. The apk words fine, you just need a file manager so you can extract the files. I’m getting an error at the title screen saying that I need to update the game, but obviously I can’t because of the absence of support for the U.S store. Help? I have the same problem. Everything install fine and the game loads fine, but as soon as I accept the terms, it tells me that it needs to connect and update. Have you figured this problem out? help to handle the look and feel of Word – Press.